'Cinnamon Sugar' ( Marty Schafer and Jan Sacks, R. 2010) Seedling S03-28-3. SIB, 24" (61 cm), Midseason bloom. 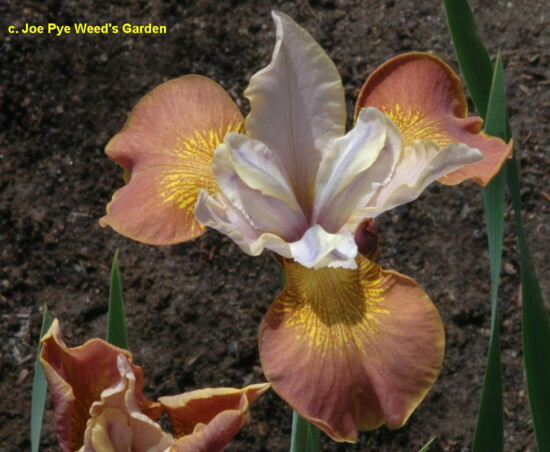 Standards palest red-violet, pale yellow edge; style arms cream, dull blue midribs, yellow tips; Falls chocolate pink (near RHS 174D/182D), signal yellow gold, chocolate pink speckles and veins overall; slight sweet fragrance. 'Tree Of Songs' X S00-46-6, 'Pretty Polly' sibling. Joe Pye Weed 2010.
jpg IMG_8184-X2_cinnamon_sugar.jpg manage 178 K 20 Feb 2016 - 23:20 BrockHeilman Please contact Brock Heilman for image use.